Pickaweb.co.uk Review 2019: Is Pickaweb.co.uk a Good Hosting? Launched in 1999, Pickaweb.co.uk is a U.K.-based web hosting vendor that serves over 20,000 customers in the United Kingdom. Operating out of a data center located in London, this customer-focused company has hosting solutions designed for small and medium-sized U.K.-based enterprises. Pickaweb.co.uk is a website hosting provider based in the United Kingdom. They were one of the first web hosting companies to introduce live chat both as a sales tool and for support. The company was founded in 1999 and today serves more than 20,000 customers. Despite being headquartered in the U.K., they also have a sizable presence in the United States, India, Vietnam, and Brazil. Their single data center is located in London. They employ 10K SAS hard drives for basic shared hosting plans and Solid States Drives (SSD) for premium plans. Pickaweb.co.uk’s data center is located in Enfield, London. According to the vendor, the data center operates on renewable power and exceeds Tier III standards. This data center powers all of their hosting solutions, allowing them to provide better support and security for their customer base of small and medium-sized businesses in the U.K.
Their Budget plan is by far the most restrictive, but this is meant as a lightweight version for those who simply want a straightforward and simple hosting solution. It doesn’t include any MySQL databases or support for any add-on domains, but it’ll give you adequate storage and bandwidth. 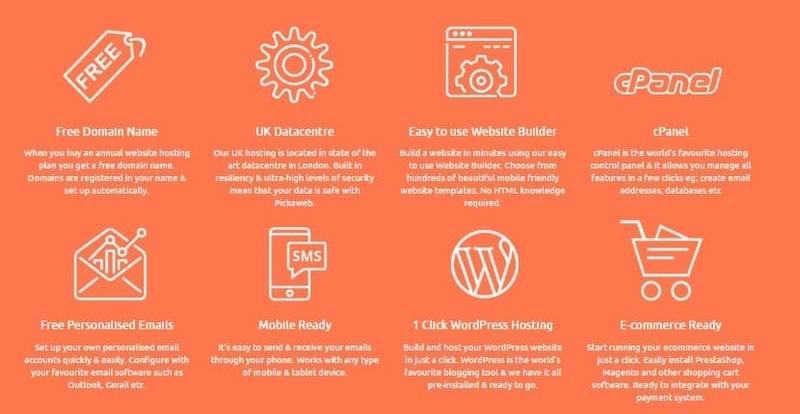 While I was pleased to see that they included a website builder and one-click app installer to empower novices, I was less pleased to see that backups don’t seem to be a standard with Pickaweb.co.uk: only their highest-tier Business shared hosting plan includes automatic daily backups. Pickaweb.co.uk offers a 99.9% uptime guarantee and have their servers configured with CloudLinux OS and LiteSpeed Web Server, ensuring a solid mix of reliability and speed with their hosting solutions. As previously mentioned, Pickaweb.co.uk’s Budget shared hosting plan is the most limiting, but it’s also the most affordable option. From there onwards, I find their plans to be a good combination of rich features and affordability. While users in countries like the U.S. might find this vendor’s prices a little higher than most of them would be willing to pay for, their pricing is not very different from other vendors in the U.K. and the rest of Europe. Sometimes, they’ll even offer promotions such as six months’ worth of free hosting with the purchase of an annual plan. They also have a 30-day money back guarantee with all their shared hosting plans. You can contact Pickaweb.co.uk’s support team via telephone, live chat, email, and fax. They have no ticketing system, but they provide a knowledge base packed with numerous articles to help you through any hosting-related challenge you’re likely to encounter. While Pickaweb.co.uk claims to offer 24/7 support, this doesn’t apply to their tech support. If you require technical assistance, you’ll have to wait for U.K. business hours. What’s more, their support is usually poor and can sometimes even leave you more confused than you were before contacting them. Also, the phone number the vendor gives for customers to contact them doesn’t work as you would expect. I called them outside of business hours, only to be taken through an automated message that informed me that I had to use their live chat. Pickaweb.co.uk is great for small businesses that require an all-inclusive web hosting solution they can grow with. However, be warned that you must know your way around hosting or at least be able to solve your own issues through the tutorials this vendor has made available. Wondering how Pickaweb.co.uk stacks up against other Web Hosting companies? Enter any other Web Hosting company and we will give you a side-by-side comparison.